This week, a [study] was published that described a new amber fossil from the Dominican Republic, dated to 45-15 million years ago. The amber contained a tick. Ticks are small arachnids (like spiders, scorpions, mites, and other 8-legged invertebrates) and are responsible for latching on to mammals, sucking their blood, and potentially (and quite frequently) spreading diseases. In the US, ticks are known for spreading Lyme Disease, Rocky Mountain Spotted Fever, and about a dozen other infections according to the Centers for Disease Control (CDC). 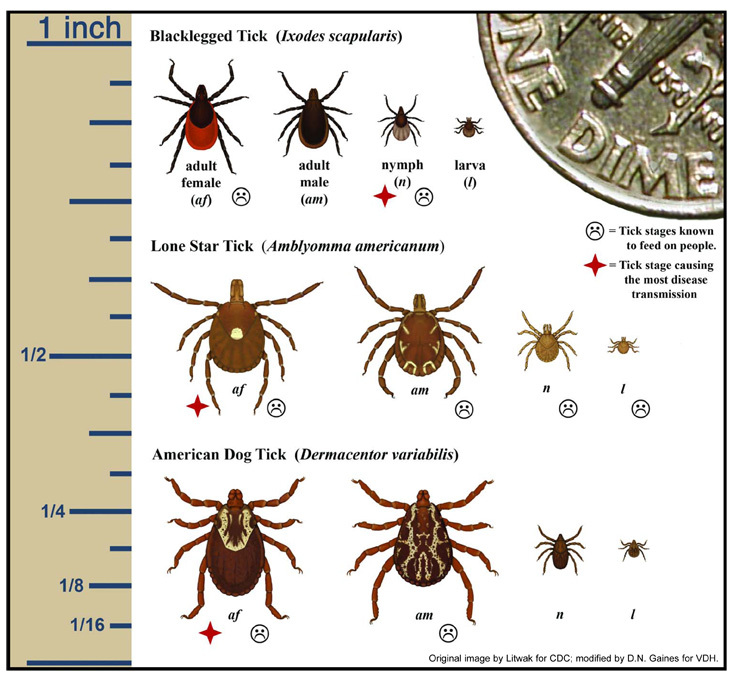 Different types of ticks in the US. From Pennsylvania County Dog Club. 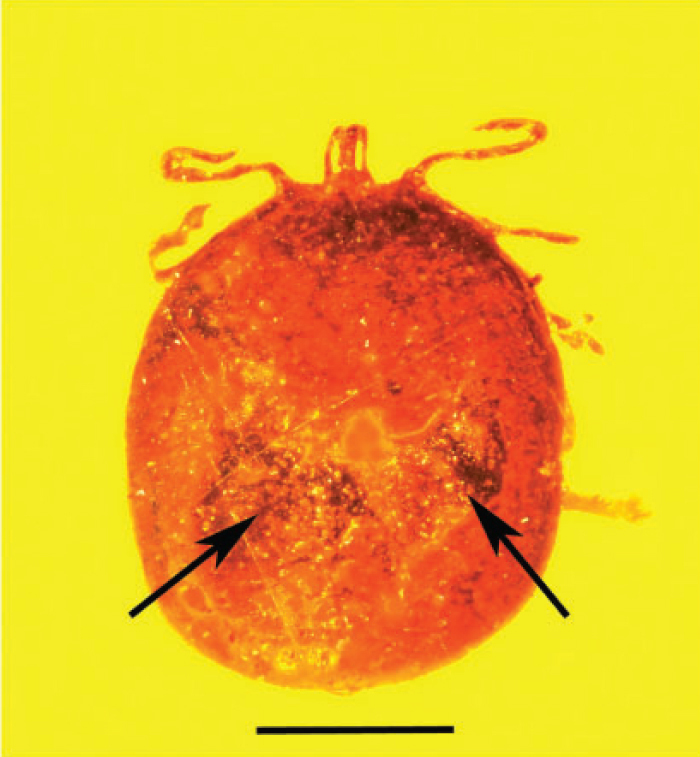 This fossil tick was no different: it was filled with blood from its last meal. The authors used high powered microscopes to examine the tick and found that it had 2 puncture marks in its back, through which some of the blood spilled. Figure 1 from the paper showing the fossil tick. The arrows indicate the puncture locations. Because of the openings, the amber preserved the blood perfectly and showed something hidden amongst the blood cells – microscopic parasites! The amber stained the blood cells and the parasites different colors, making them easily distinguishable under the microscope. 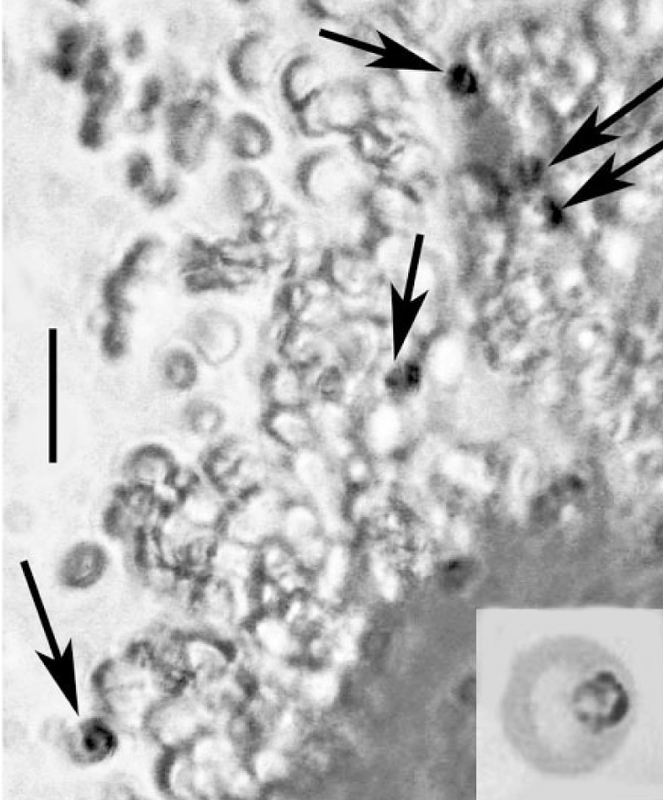 Figure 3 from the paper showing the blood cells as clear circles and parasitic cells as dark circles (with arrows). Scale bar is 20 micrometers. They named this new species Paleohaimatus calabresi (“ancient blood” and “Calabrese” after the person who provided the fossil). Comparing it to modern tick-borne parasites, the authors identified the fossil parasite to be closest in size and shape to the modern Babesia genus, a known group of tick-borne parasites. These parasites feed off the juicy insides of blood cells, and have different shapes based on which part of their life cycle they’re in. They also infect the guts of the tick. The authors also examined the healthy blood cells. Red blood cells are almost donut shaped and have no nucleus. They contain hemoglobin, which is a protein that transports oxygen to cells around the body. In mammals, the red blood cells are different sizes in different species, so by measuring the cells, the authors were able to confirm that the tick fed from a mammal, and what kind of mammal it was. Of the three types of mammals with red blood cell diameters of 6.9-7.3 micrometer (primates, canines, and lagomorphs), only primates were in the Dominican Republic at the time this tick was fossilized. 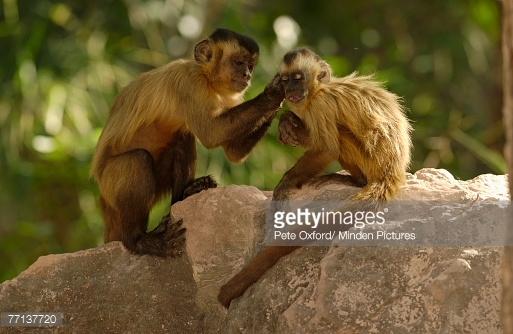 Cebus apella grooming each other. Primates groom each other and some live in trees, so it is likely that this tick was feeding on a primate, was found while being groomed by another primate, was picked off, and tossed away, landing on a tree and getting trapped in the sap. A sad day for the tick, but a happy event for paleontologists to find.